Play All by Clive James, published by Yale University Press on 20 August at £14.99. Everyone who has written television criticism since the 1970s, including this reviewer, has done so in the long shadow of Clive James. Writing his TV review for this newspaper from 1972 to 1982, he effectively turned a column into a genre, and did so with a wit and a learning unlikely to be equalled. There’s an impulse to speak in the reflective language of the obituarist with James simply because, by his own reckoning and that of his doctors, he has been poised at life’s final credits for several years. Yet his various terminal ailments have not hindered his output either as a poet or a critic. His latest – I won’t say last – collection is a joyfully intelligent appraisal of the major US series – the box sets – that have taken TV to previously unexplored heights over the past decade or two: among them The Sopranos, The Wire and The West Wing. 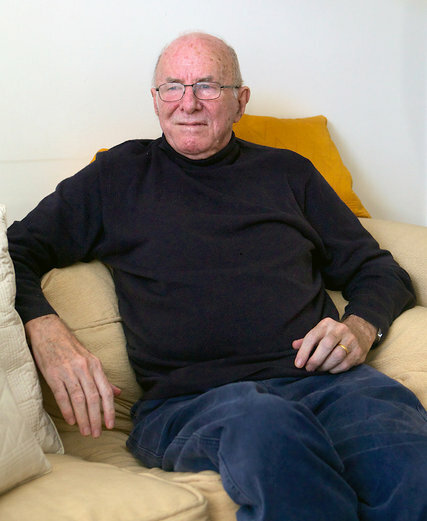 Writer and TV critic Clive James at his home in Cambridge, England. Chris Bourchier / REX / Shutterstock. Clive James is the great appreciator of our time. Over the course of his career – which first took flight when The Metropolitan Critic was published in 1974, and in which he has worked as a novelist, poet, columnist, television critic, broadcaster, essayist, autobiographer, travel writer and translator – he has arguably done more than any figure of his generation to transmit to the reader, the viewer, the listener, his enthusiasm for the arts. He has pursued this project at all cultural levels. The weighty novel, the satiric squib, the comic verse, the sedulously crafted lyric, the spine-tingling aria, the contagious pop song, the trashiest of trash television, the sweep and majesty of box set dramas – James treats them all with equal seriousness, equal care, equal love. And always he proceeds from the principle of enjoyment. IMAGINE you’ve just received an email from the Grim Reaper telling you it’s time to get your affairs in order and to make your way to the departure lounge. How best to spend your last few, sentient hours? In 2010 Clive James was diagnosed with leukaemia and informed that his days were numbered. His instinctive response was to read and reread, and write. Marooned in a book-lined flat he has been more productive of late than a hyperactive ant. He has completed a translation of Dante’s Divine Comedy, a commentary in verse on Proust, a rather wonderful collection of poetry and Last Readings, reflections on the writers and books that have been his constant companions through a life thirled to print. Now 76, he is still with us and showing no signs that he is about to leap aboard a plane to nowhere. In Play All, sub-titled A Bingewatcher’s Notebook, he turns his gaze on television, of which he was the best critic I have come across. Between 1972 and 1982, his column in the Observer was a plum pudding replete with one-liners that made one gasp at their audacity. My favourite was his description of the ice-skaters Torvill and Dean, dressed in gold costumes, which James likened to two packets of Benson and Hedges cigarettes dancing in a fridge. Since then television has changed almost beyond recognition, as has the manner in which we consume it. One such development is the box set which allows us to watch programmes as and when we want. Should we so choose we can spend whole days immersed in the likes of House of Cards and Band of Brothers, which some regard as a balm and others as a portent of civilisation’s imminent demise. Clive James: Binge-watching TV saved my family. It is lunchtime in Cambridge on a warm day in July, and Clive James is boiling eggs. Don't let me forget these, he says as he welcomes me into his home, Because I will. The indignities of old age. I am joining James in the closing stages of a professional life (he describes the period to me as his ) during which he has established himself as an essayist, autobiographer, novelist, poet, columnist, broadcaster, TV critic and, more recently, as a translator of Dante. We intend to discuss his fascinating new book, Play All: a Bingewatcher's Notebook, in which he attempts to get to grips with the phenomenon of contemporary television and understand his deep love of the box set. The water-cooler moments never went away, they just intensified. For my parents' generation, JR and his shooting in Dallas was the TV moment that gripped a whole generation across the western world and indeed beyond. For this current HBO generation, such axial scenes are now a weekly occurrence to be muttered feverishly over in the office on a Tuesday morning. 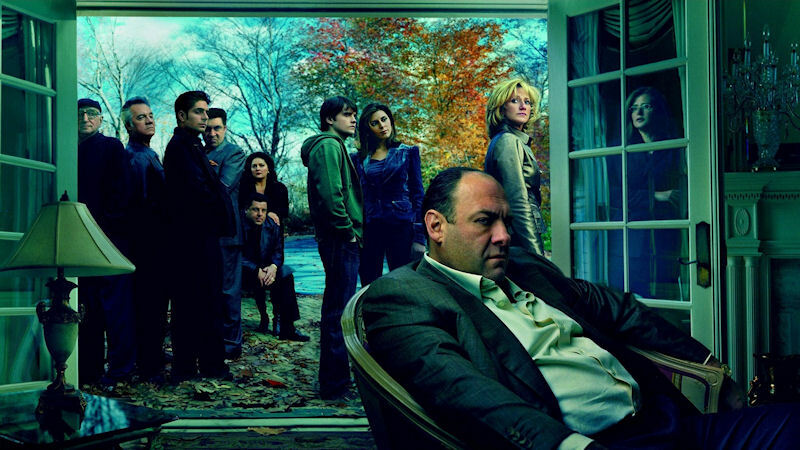 Remember how the abrupt farewell of The Sopranos was debated? Heck, Game of Thrones has built a career out of periodically gunning down its various JRs. For Clive James, the Australian writer, poet, wit and all-round linguistic polymath, the advent of the box set is a thing worthy of his sharp critical muscle, a skill that 30-something published titles and one leukaemia diagnosis later, has not been dulled one jot. James was told the bad news in 2010 that he had a "polite but insidious" form of the cancer and was put on a course of Ibrutinib as part of his treatment (typically, he disarms the seriousness of the situation by likening the chemo drug's name to that of "the hero of one of those post-Conan movies starring some sack of sculpted tofu who will never be Arnold Schwarzenegger"). It birthed a rush of productivity in him - a book a year (poetry or non-fiction) has appeared since. It also meant there was now rest time on the Cambridge resident's hands. And besides, modern technology had granted humanity the "play all" function, something undreamt of in those Dallas days. "Binge" is an anagram of "being", he urges us to consider. The practice of knocking off four or five episodes of The Wire is now an option for those "who have run so short of time that time no longer matters, and who are thus able to choose exactly what we want to see next". There is much to discuss, as far as the award-winning Observer TV critic (1972-1982) is concerned….. This is such a generous example or what you'll find between the covers of Play All: A Bingewatcher's Notebook that I'm not going to quote from it. I recommend that it be read whole..
Clive JamesCredit Hazel Thompson for The New York Times It’s not often that an author announces his obsolescence on his very own book cover, but with “Play All,” the redoubtable Clive James has found a title that neatly demarcates how late he is to the party. Maybe the only thing that matters is that Mr. James, who reviewed television for The Observer back in the 1970s and remains an enduring entertainment fixture in his British homeland, seems just now to be getting around to series that entered (and, in a few cases, departed) the cultural conversation years ago. So if you were wondering what the author really thinks about “Band of Brothers” (2001) or “NYPD Blue” (1993-2005) or “Studio 60 on the Sunset Strip” (2006-7) or “The Wire” (2002-8) — or, hell, “Shogun” (1980) — this is the volume to slake your curiosity. If you needed someone to explain to you that Frank Underwood, the antihero of “House of Cards,” owes something to Machiavelli; that “Mad Men” is “shorthand for Madison Avenue men”; that movie spectacles ask us to “switch off our brains”; and that modern television has exploded “the old idea of a single auteur,” then by all means hunker down. Nearly two years after predicting his own imminent demise, Clive James is not only still alive and kicking, but still publishing. Good. He may be “highly embarrassed” by this, but on the evidence of Play All: A Bingewatcher’s Notebook, it’s a boon for the rest of us. Like any serious writing on TV, this essay collection runs the risk of appearing superfluous. Many will seek out an expert’s view on, say, Mona Hatoum’s installations at the Tate, but no one feels unqualified to pontificate on last night’s Poldark. Yet even while the office water cooler runs dry through overuse, James’s writing remains thirst-quenchingly essential. As the Observer’s TV critic from 1972 to 1982, he played a key role in elevating the people’s art form to its current high status. If anyone has earned the right to pass off telly-watching as a hard day’s graft, he has. 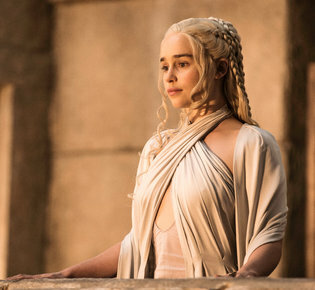 Clive James: Why would anyone both adult and sane watch Game of Thrones? 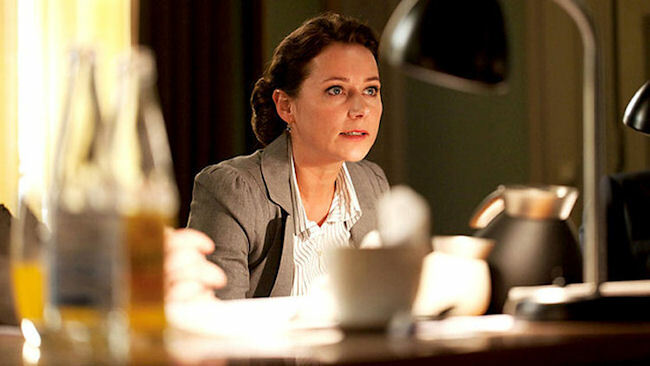 Enough to make Don Draper blush: Sidse Babett Knudsen as the “radiantly intelligent” Birgitte Nyborg in Borgen. 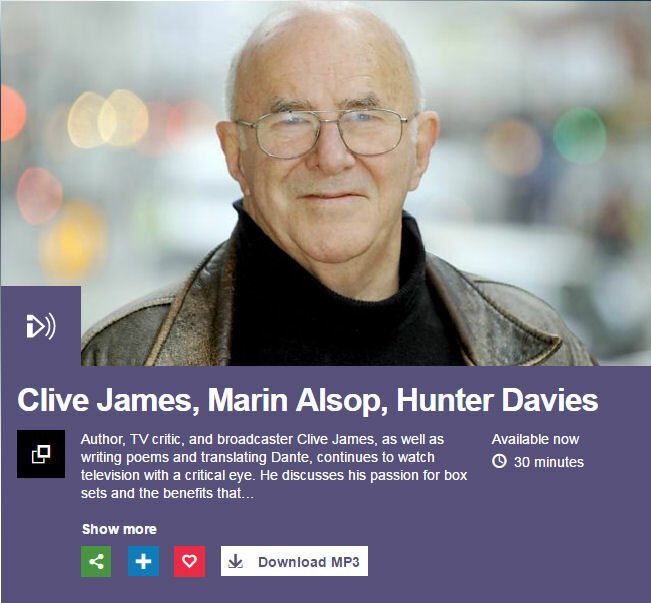 Poet, philosopher and polymath, with an intellectual range that has swept through the works of Dante, Proust and Samuel Johnson, the major poems of Browning and several hundred of the best twentieth-century novels in the years since his diagnosis, Clive James is also something of a media junkie. He likes watching TV. A lot. For a couple of decades he liked being on it, until in 2000 he decided that the “Blaze of Obscurity,” as he put it, was getting to him. So he wrote a book about it, and retreated to more contemplative pursuits, though those did include regular contributions as a television critic for London’s Daily Telegraph. With this book – after a few decades spent making TV shows, writing poetry, cultural criticism and memoir, and translating Dante – Clive James returns to the field he made his own. From 1972 to 1982, on the back page of the Observer Review, he turned the witty television column into an art form. Indeed, his reviews were often more inventive than the programmes he wrote about, given his focus on the cheap US imports, light entertainment shows and soap operas that most viewers watched and most reviewers ignored. His style, smart as paint and full of esoteric references, but entranced by the stupid and the stupidly enjoyable, has been widely copied but never surpassed. In the ’80s, Clive James said TV would never be more than “mediocre.” Then, devouring endless hours of television changed his mind. The culture critic, memoirist, poet, and public intellectual Clive James worked as a TV critic for the Observer from 1972 to 1982, writing erudite TV criticism at a time when that was about as common as erudite TV. In his final column, he proclaimed that American television was never going to be more than mediocre. Nearly three decades later James, an Australian who has lived in the U.K. since the early 1960s, was diagnosed with leukemia. Ill, medicated, and stuck on the couch, he did what most people do for far inferior reasons: He started binge-watching. 200 pp. Yale University Press. $25.